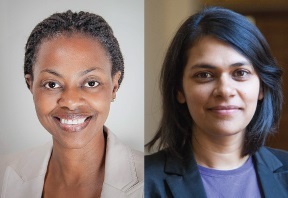 The School of Education will present another installment of the Douglas P. Biklen Landscape of Urban Education Lecture Series on Monday, March 16, featuring scholars from Teachers College, Columbia University, Lalitha Vasudevan and Yolanda Sealey-Ruiz. They will present “Youth, Media and Educational Justice: Cultivating Wellbeing Through Collaborative Inquiry” at 4 p.m. in the Maxwell Hall auditorium. The lecture is free and open to the public, and CART (Communication Access Real-time Translation) services will be provided. Access to educational opportunities continues to be challenging for young people who are already involved in the foster care and juvenile justice systems. The presenters identify these young people as “court-involved youth.” In this talk, Vasudevan and Sealey-Ruiz share examples from their experience as co-teachers of a yearlong, participatory seminar, where they brought together graduate students and court-involved youth in an attempt to create opportunities for inquiry, understanding and support of the young people’s educational well-being. Lalitha Vasudevan is associate professor and coordinator of the Program in Communication, Media and Learning Technologies Design at Teachers College, Columbia University. She studies the narrative and communicative practices of adolescents and focuses particularly on the lives young people involved the juvenile justice system. Recently, she co-edited “Arts, Media, and Justice: Multimodal explorations with youth” (2013, Peter Lang) and is currently writing a book about education, multimodal play and belonging in the lives of court-involved youth. Yolanda Sealey-Ruiz is assistant professor of English education at Teachers College, Columbia University. Concerned with equity pedagogy, her work examines the racial literacy knowledge of teachers, the development of culturally responsive pedagogy and the literate identities of black and Latino male high school students. Since 2005, the Landscape of Urban Education Lecture Series has been dedicated to the presentation of current ideas and strategies for navigating urban education terrain in the United States. The speakers engaged for this series are renowned scholars committed to revitalizing inclusive urban education. The School of Education invites all students, alumni, staff, faculty and friends in the community to experience these presentations.